Dr. Erika Offerdahl (left) with post-doctoral researcher Jessie Arneson. by Marcia Hill Gossard, ’99, ’04 Ph.D. | Photo by Henry Moore, Jr.
Students who study molecular biosciences can’t actually see what they are learning. Symbols, such as chemical formulas, or schematic drawings that use arrows to show a chemical reaction are just two examples of this type of visual learning. Information can also be conveyed through graphs, cartoons or other artist renderings, or through realistic images such as a micrograph photo of a cell taken through a microscope. She and her colleagues not only research how visual learning is taught to students, but whether students need different skills to understand or replicate different types of representations. In other words, what visual thinking skills do students need to be visually literate and understand a graphic representation versus a schematic model? Ultimately, by understanding the most effective ways to learn and retain visual literacy skills, their research could help improve student education in many STEM disciplines. But for Offerdahl, learning visual literacy extends beyond the classroom. Many of her students go on to become doctors or pharmacists, rather than academic researchers, so they will need to know how to communicate well with their patients. And scientists play an important role in society, she says, so there is a need for them to better communicate their scientific research. A schematic example a student might see. 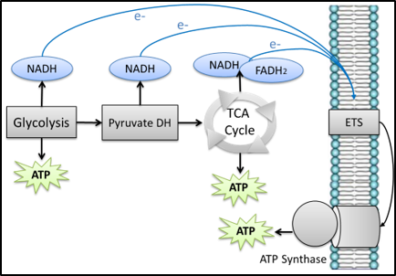 It shows how some metabolic processes contribute to ATP production. ATP molecules store and transfer chemical energy that can be used to drive many processes within cells. Improving the heath of animals and people at home and around the world.